Jen McMorran Realtor, SRES | Be Home. Be Well. Jen McMorran Realtor, SRES – Be Home. Be Well. April showings bring May closings! The Spring Market is here and our Kensington Real Estate office has some awesome Homes for sale. Could one of these be right for you or anyone you know? Built 2016, like new, upgrades! First floor master and in-law suite possibilties. Unbelievably spacious and conveniently located! Almost ready & just gorgeous!! Don’t see what you are looking for? Give a call 508-930-5259 or send an e-mail with your must-haves, your wishlist, desired towns, and price range. We have more inventory that should be hitting the market soon. If you’d like help with searching for your next home, know that happy endings are my specialty! Are you wondering if buying a home is a possibility for you? Do you dream of personalizing a home to your own tastes and lifestyle? Are you tired of paying your landlord’s mortgage and being limited their rules? First Time Home Buyers are one of my specialties and I have many satisfied “first timers” who made it through the process. Happy to make a connection if you’d like to talk with someone who has recently been through a complete transaction from searching on-line to getting their keys at the closing table. And as they will all attest to, I have lots of stories to share from my vast experience in real estate over the past 20+ years 🙂 Every deal seems to have its own nuances these days, but be assured, I have a solid reputation in the real estate industry, I always have an eye on the big picture while working through the little details, and I am committed to the goals of my buyers and sellers. Coming soon to a neighborhood for you! 76 Ingall Lane in Attleboro is well underway on the sought after and last remaining cul-de-sac lot of Phase II in Brigham Hill Estates. Are you ready? Because this one could be ready in April! Surrounded by other amazing custom homes, 76 Ingall Lane is a 2600sf, 3BR, 2.5BA Colonial and will once again offer incredible style and the superior quality that all of our buyers have grown to expect (along with many of the Attleboro area’s best realtors who bring clients back again and again). 76 Ingall Lane boasts amazing space for everyone. The main living level features a gourmet kitchen with huge island and open floor plan to dining area and spacious family room with fireplace & built-ins, a formal dining room, a butlers pantry, and a stylish mudroom. Upstairs enjoy a luxurious master suite, two additional great sized bedrooms, plus a bonus room above the garage for an office, playroom, nursery, hobby room, or just a you-room. Need more space? You will love the full walk out basement with tons of full sized windows & light, rough plumbing for a future bath, and unbelievable possibilities!!! Do you enjoy sunsets? Fresh air? Relaxing and playing in a your yard? This home sits on a 20,000sf lot that is fairly shallow as you can see from the pictures, but don’t worry! The charming covered deck off of the kitchen, beautiful views of greenspace, huge side yard, woods for privacy in the back of the house totally make up for that! Brigham Hill Estates has become the destination for buyers searching for high end new construction in an established subdivision of luxury homes. Whether traveling to the Rhode Island, Massachusetts, or Connecticut by car, flying out of TF Green or Logan Airport for work and leisure, or jumping on a train to get into Boston, Brigham Hill Estates is the perfect location to call Home. Once our homes near completion, they do not last long on the market! Give a call 508-930-5259 and let’s set up a time to take a tour and talk about how we can make your dream home a reality. Homeowners really do throw better Super Bowl Parties! Now’s the time to find your new home for Super Bowl LIV in 2020! Brand NEW upscale custom Townhouses, luxury new construction, turn-key Colonials, commercial property, two-family investment property, and more! We have something for everyone. And if you don’t see it in our listing inventory, we can certainly find it for you. Anything here interest you? If you are serious about buying , we are serious about finding you a home! No matter whether you’d like to buy now or you are beginning the process, give a call 508-930-5259. We’d love to get you started with your next move! 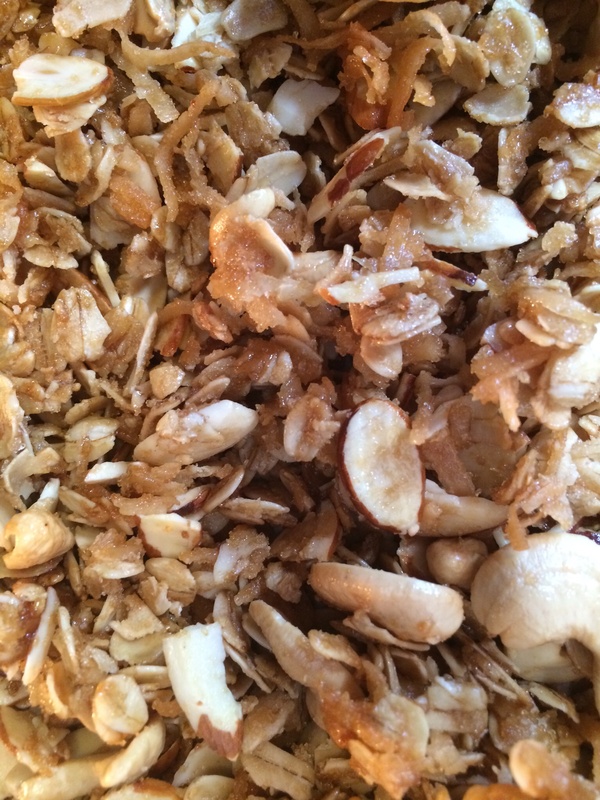 This one’s for you Rachel… The BEST granola recipe! But back to what’s important… This granola recipe is fool proof – believe me whomever you share this with will thank you. I definitely know Rachel’s daughter Janie will!! Best breakfast ever… granola and vanilla greek yogurt. No matter what has happened in the morning, this little dish of delciousness always gets me back on track and ready to face the day. You can’t beat the combination of savory and sweet. I encourage you to do some experimenting as well! This recipe is a good starting point for any additional fruits, nuts, or any other flavors you’d like to add. In one bowl, combine the oats, nuts, coconut, and brown sugar. In separate bowl, combine maple syrup, oil, and salt. Mix until fully incorporated into a syrup. Pour syrup mixture over oat & nut mixture and mix until syrup is fully distributed. Split mixture between two cookie sheets. Cook for 1 hour and 15 minutes, stirring and turning every 15 minutes to achieve even golden brown color. Remove from oven, cool a bit, and then combine with dried fruit if desired. **You can use a variety of favorite nuts, just keep measured amounts of nuts the same and you should be all set. Enjoy!